I have thoroughly enjoyed using the Jan Marini Sunscreen + Antioxidant with an SPF 33. This sunscreen is infused with antioxidants, and we all know how important antioxidants are for achieving healthy youthful skin. Think of antioxidants as little soldiers that fight pesky unwanted invaders that cause your skin to look tired, cause your skin to age faster, and stop free radicals that may cause cancer on your skin. I think Jan Marini is on the right track by formulating a sunscreen that has antioxidants. I have used this sunscreen every day for the last month and more, and I have enjoyed using it on its own or under my makeup. It goes on the skin cool and quickly fades into the skin without leaving the "white-cast" that most traditional sunscreens leave on the skin. I have oily skin, and this sunscreen did not break out my skin. I noticed that throughout the day, my skin did not produce too much oil either (well, thanks to a more advanced skin care routine) but this sunscreen did a fantastic job fighting off bad UV rays and pesky free-radicals plus environmental damages. I can feel a difference. 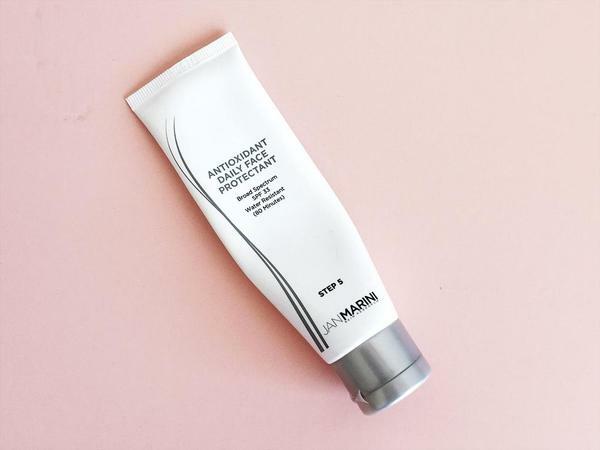 This sunscreen is also water resistant for up to 80 minutes, so whether you are going swimming or working-out outside or simply doing activities that might cause you to sweat, Jan Marini Sunscreen has got you covered. The scent of this sunscreen is very lovely; it has a sweet, fruity smell that reminds me of a tropical fragrance. The texture is light and creamy (not heavy at all) and dries quickly on the skin. Have you tried any skincare products from Jan Marini?